MPTours offers the best city tour ever and you don’t need to follow the crowd. Whether you use o2 broadband or dial up, you can download a walking tour to your ipod or mp3 player and get a fresh, cinematic, engaging and insider’s guide to Buenos Aires’ most fascinating neighborhoods. Digital map and email postcards are great add-ons. Beautiful people, world-class venues, tango, techno and cumbia, and a dedication to staying up till dawn has made Buenos Aires an international party destination. But without local friends, finding your way to the best spots can be daunting. Until now. With our free guide to Buenos Aires nightlife you get an insiders’ list of the 10 coolest venues that are not to be missed, along with great advice to ensure an unforgettable night out. 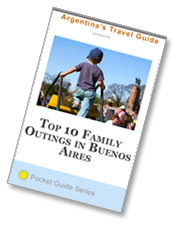 This free pocket guide includes 10 great outings for you and your family to do while on vacation in Argentina. Looking for English-language books in Buenos Aires? Do you simply love bookstores? The city is full of book shop gems. This handy little guide lists the best places to find your next read. This page rendered in 0.072 seconds.